Throughout history, Mexico has made numerous gifts to its big neighbor to the north. Tomatoes, avocados and chiles all came from Mexico, and the state of Baja California alone has contributed fish tacos, Caesar salads, and margaritas. Over the years, the U.S. has received many Mexican sons and daughters, and even, following the Mexican-American War – it gave Americans the entire state of California. Native to the area around present-day Taxco, the Aztecs cultivated the plant they called Cuetlayochitl (Cuetlaxochitle in some references), using the sap to control fevers and the bracts (modified leaves) to make a reddish dye. The plant was so popular that even Montezuma had them caravanned into Mexico City as they could not be grown in that high altitude. What is a Mexican tradition without a supporting legend? The poinsettia legend has a poor Mexican girl named Pepita walking with her brother (or cousin, versions vary) Pedro to Christmas Eve services at the village church where people made gifts to the Christ Child. She was sad as she had no gift. So Pepita knelt by the roadside and scooped a handful of common weeds and tried to fashion them into a presentable bouquet. In the chapel, Pepita placed the makeshift bouquet at the foot of the Nativity scene. Suddenly the weeds burst into beautiful red blooms and all who saw were certain they had witnessed a miracle. From then on, the flower in Mexico became known as the Flor de Nochebuena, or Flower of the Holy Night. The botanical name is also colorful (for Latin) and the plants were named Euphorbia pulcherrima Wild (pulcherrima means most beautiful) by German botanist Wilenow who was dazzled by their color. The Mexicans have their name for the flower and the scientists have their identifying moniker, but how did Americans come to know it as the poinsettia? 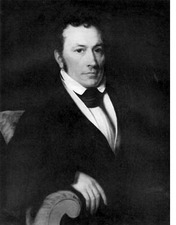 John Roberts Poinsett.Born in South Carolina in 1779, Poinsett became a special agent to South America, served in his state legislature, and was a member of the U.S. House of Representatives before heading to Mexico as special envoy. He was the first American ambassador to Mexico (appointed by Andrew Jackson) and was later a Unionist in rebel South Carolina. His outstanding career also included serving as Secretary of War under Martin Van Buren (1837-1841). But Poinsett is best known for the flower that bears his name. An accomplished botanist, in 1825 he sent some of the brilliant flowers from Mexico to his own nursery in South Carolina, and also to other friends and American horticulturalists, and they thrived. As the plant became more popular, historian and horticulturalist William Prescott was asked to give the plant a popular name. He chose poinsettia, honoring John Poinsett’s contribution. The present-day poinsettia has been hybridized greatly in the U.S. and Europe from the original Mexican plant. Today there are over 100 varieties, with varying heights, colors (red, pink, white), bract width, and flowering habits. Today 90 percent of all poinsettias are grown in the United States. They are commercially grown in all 50 states, with California the top producer. One of the world’s largest commercial growers is the Paul Ecke Ranch in nearby Encinitis, which grows over 80 percent of the U.S. wholesale market. In fact, 90 percent of all flowering poinsettias in the world got their start at the Paul Ecke Ranch in north San Diego County. Paul Ecke poinsettias are known for huge, giant bloom centers and a unique single stem presentation. They are sold locally at San Clemente Florists (158 Avenida Del Mar) and Mother Earth Flowers (32158 Camino Capistrano in SJC). December 12 has been designated National Poinsettia Day and the flower represents 85 percent of all potted plant sales during the holiday season. Hundreds of millions of dollars’ worth of poinsettias are sold during the brief six week season. 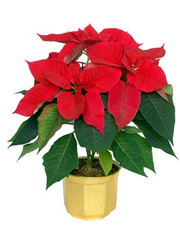 Poinsettias grow rapidly in Southern California, and do well in coastal areas like San Clemente. That simple holiday pot, planted in a yard will, in a few short years, be a flowering tree. The number of blooms determines the cost of a poinsettia. Red rules, as 74 percent of all Americans prefer that color to white (8 percent) and pink (6 percent). Women purchase 80 percent of America’s best-selling potted plant. In the large supermarkets and wholesale outlets like Costco, poinsettias are as ubiquitous at yuletide as chewing gum at the checkout counter, except, because of the size and brilliance, the poinsettias are much more obvious and shopping carts quickly get filled with them.